Place the sliced onion in a medium mixing bowl and combine with the remaining marinade ingredients. Refrigerate to marinate, 30 minutes. In a heavy-based saucepan, bring 1L salted water to a boil. Blanch the broccoli, green beans and mange tout. Strain and immediately immerse in iced water to refresh. 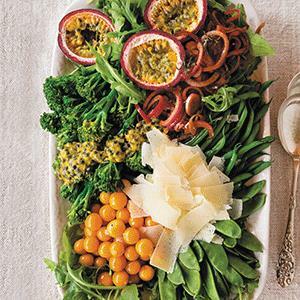 On a platter, arrange the marinated onion, broccoli, green beans, mange tout, gooseberries and rocket. Drizzle with the granadilla pulp and top with Parmesan shavings to serve.